Rufus & Coco Bone Dry is a professional grooming chamois for washing and drying your pet! How to get your pet dry in no time! 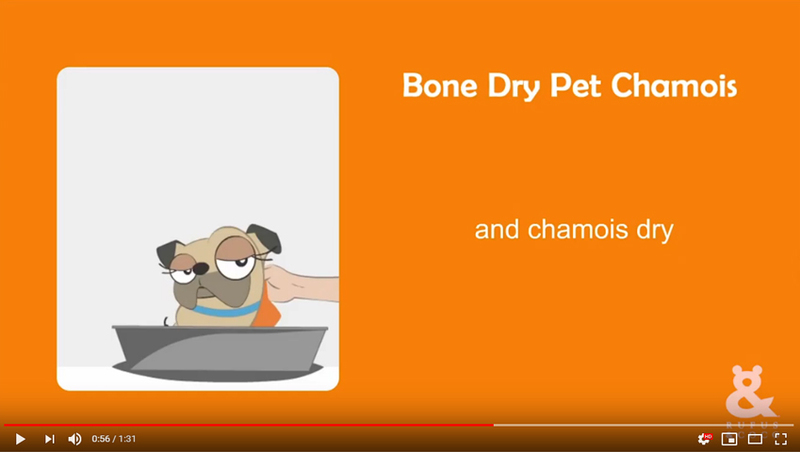 Simply remove the Bone Dry chamois from the canister and wipe over your pet until dry. When the chamois feels heavy and full, just wring it out and keep drying. After use, rise the chamois in cold, clean water and gently wring out. Do not use soaps, bleach or fabric softener to clean the chamois. Roll the chamois, and store in the original canister with the lid tightly closed. If the chamois becomes dry and hard, soak it in water and it will quickly become flexible and soft again. "Ahh, don't you just love a wash? I do, but my owner used to avoid my bath 'cause of all the smelly towels we used. But not anymore. With this super absorbent chamois I am washed and dried in no time. Now, I hate to ruin it by jumping in another puddle but... "
5 things that could harm your pet this spring!